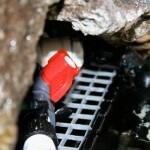 EcoTech Marine wants your videos of the VorTech in action. Simply send in a short video and you will be entered into their VorTech Video Contest and have a chance to win an MP10. 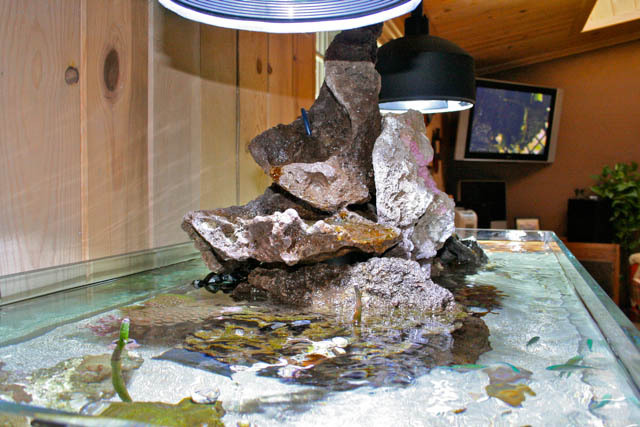 The video must be under three minutes, and must show the VorTech in your aquarium. You can upload the video to YouTube of Vimeo and then click here and fill out the form. The deadline for submitting a video is November 27th, and the winner will be announced on December 1st. Good luck and get creative!! 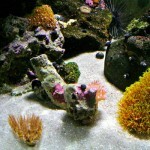 Volcano Reef Tank. 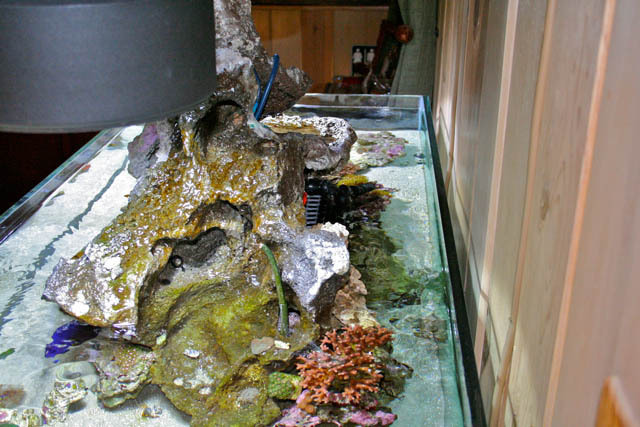 We recently came across a very unique reef tank. 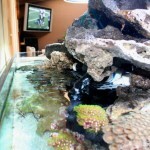 This 75 Gallon custom rimless reef tank, by Kyle Verry of www.konolua.com, was designed with an exposed rock structure extending over 1′ out of the water. 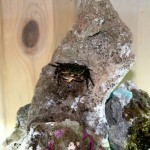 Kyle’s affinity to many crab species played an important part in the tank design and concept. 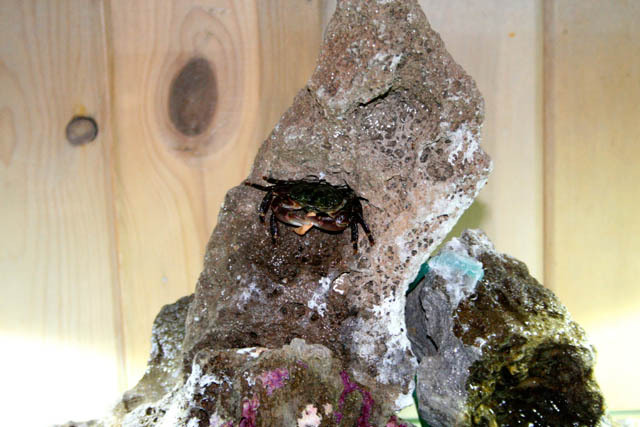 Amongst the tank’s many inhabitants, Kyle had chosen to include Striped Shore Crabs (Pachygrapsus crassipes), which spend a significant amount of time out of the water. 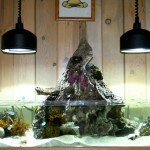 Although a young tank in many respects, we believe it is more than worthy of being a featured tank on Reef Tools. This 48″ x 24″ x 12″ rimless tank was custom made with an overflow that is slightly offset (front-to-back) from being dead center. 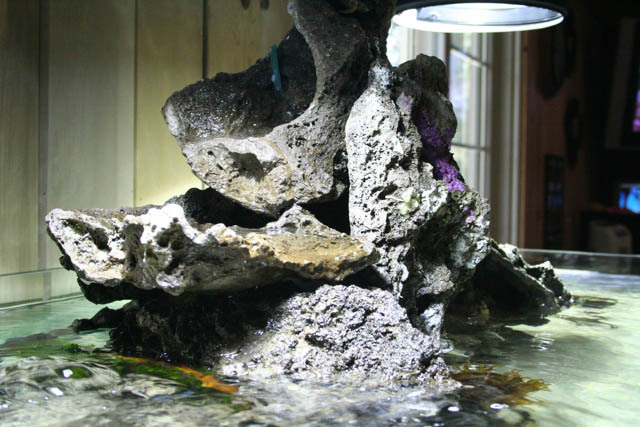 Kyle used dry rock to form a beautiful volcano-like structure featuring three waterfalls. This structure was built on, and hides the center overflow. The return is split in the back of the structure and is used to feed all three waterfalls. 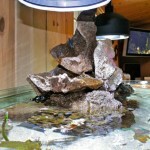 You will see several mangroves strategically placed throughout, adding a wonderful green element to this tank. 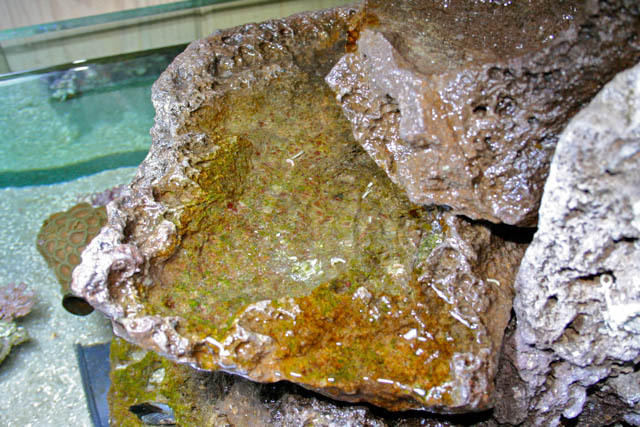 The rock structure is only being held on by gravity, and maintenance on the overflow can easily be completed by removing two rocks. 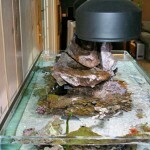 An ASM G2 Protein Skimmer provides the filtration for this reef tank. 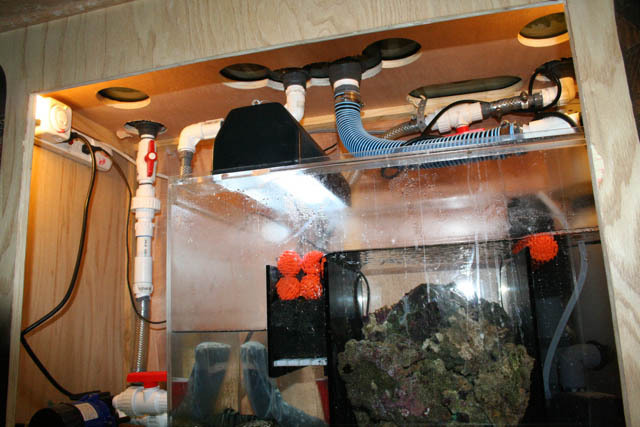 Additionally, Kyle has implemented an automatic waterchange system, which allow him to perform his 20-25 Gallons weekly waterchanges in about 3-4 minutes. Lighting on this beautiful tank consists of 2 150W HQIs, which are strategically placed to keep the tip of the volcano dark. 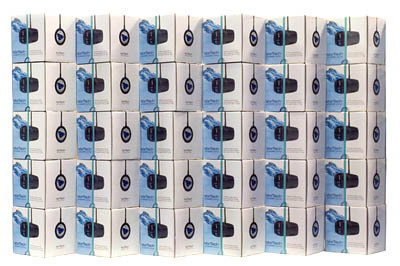 Kyle currently uses 12K Helios bulbs and pendants. 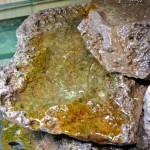 Kyle has added a selection of soft corals, including pulsating xenia, green star polyps, mushroom, and zoas. A school of blue-green chromis, are a staple in Kyle’s tanks. 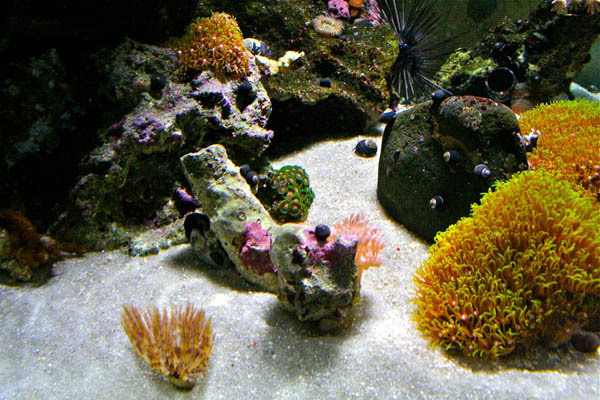 Alongside the chromis, a purple tang, dwarf lion fish, a dusky jawfish and various other invertebrates roam this spectacular reef tank. Here are a few questions that Kyle hears frequently. Q.Does the tank, and in particular the volcano, have an odor? A. 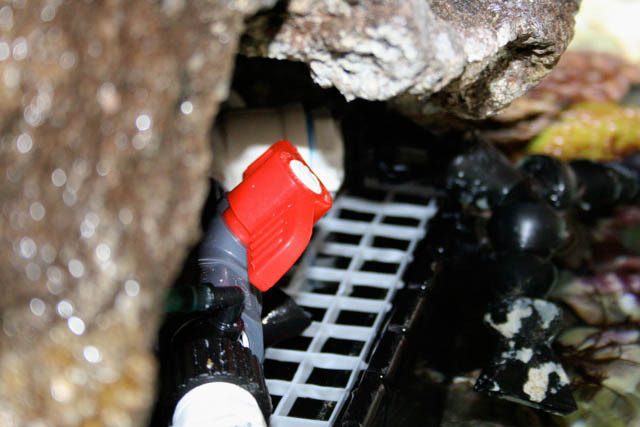 Since Kyle used dry rock to create the structure, there was no die off and therefore not foul smell associated with the exposed tank. Q. How do you keep the glass looking so clean? 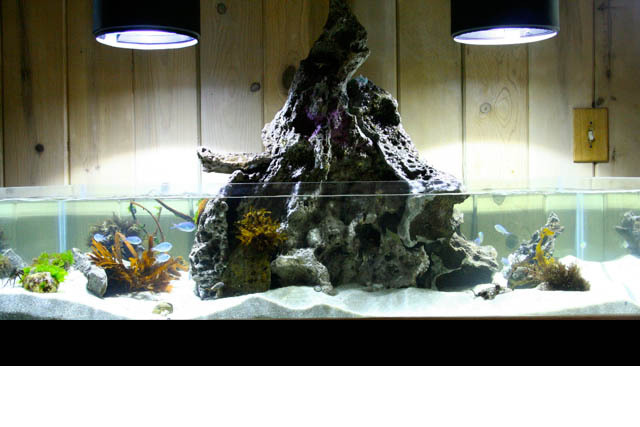 Kyle plans on adding a dedicated circuit for this tank later on this week. 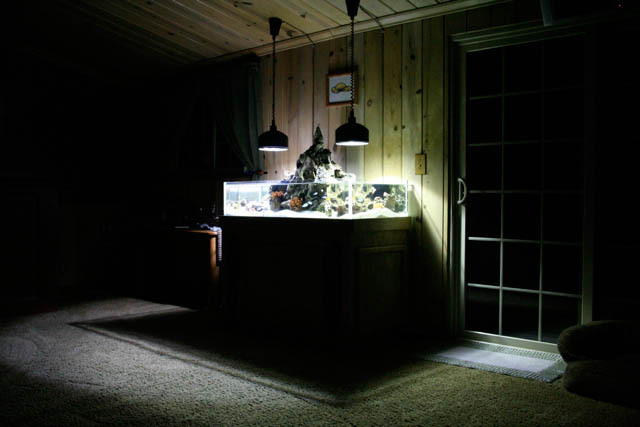 The Metal Halides bulbs will be replaced with 14K Ushios in the near future. 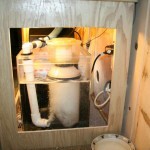 Kyle is also planning on implementing a refugium using the existing sump. 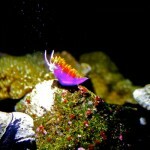 We are confident that many exciting and impressive things are still to come from Kyle Verry of www.konolua.com. 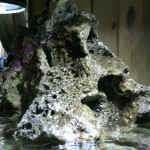 Click here to check out Kyle’s Reef Tools Live profile for updated photos. In an effort to encourage captive breeding of marine fishes and invertebrates, MASM is happy, and proud, to announce the start of the MASM Breeding Initiative! 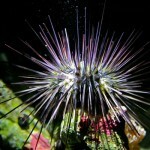 MASM would like to involve everyone that is currently breeding as well as those that are interested in giving it a try. In the next few weeks MASM will set forth the guidelines for the Breeding Initiative, which will take place over the course of the next year and is open to anyone that would like to get involved, MASM membership is not a requirement to participate in the MASM Breeding Initiative. 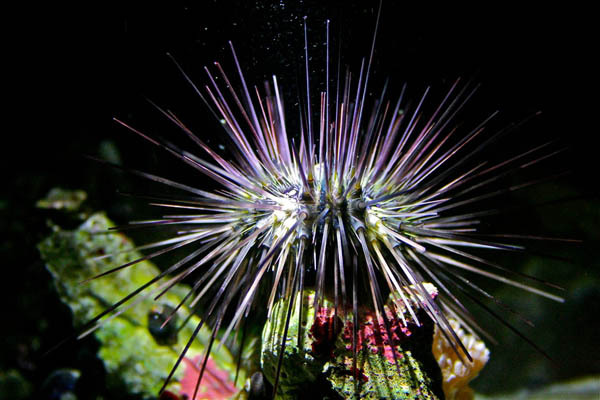 The initiative will include a Breeder’s Challenge where anyone that is interested in breeding ornamental marine fish or invertebrates will have the opportunity and support to do so. MASM will be organizing a group buy for equipment and materials for local breeders interested in getting involved in the Initiative. They will have dedicated forums for participants to create breeding logs to document, and to ask questions about, their projects. MASM is also extremely happy to announce that master breeders Matt Wittenrich, author of “The Complete Illustrated Breeder’s Guide to Marine Aquarium Fishes” and Matt Pedersen, MASNA’s 2009 Hobbyist of the Year, have volunteered to act as advisors for the MASM Breeding Initiative and will help answer the more difficult breeding questions posted on the MASM forums. As a special treat, MASM will be holding a“Breeder’s Workshop” in March 2010 where both Matt Wittenrich and Matt Pedersen will be in town to speak about the subject of captive breeding and the necessity of it! This will be more than a simple lecture. A short lecture and Q&A session from each speaker will be followed by a social gathering where attendees will have plenty of personal, “one on one” time with both Matts. This will be a great opportunity to get individual questions answered by the experts and to share your successes and difficulties experienced through the first several months of the Breeder’s Challenge! They are both marked with a: on them so they are pretty easy to pick out. While there are a few details up in the air one requirement is that anyone involved in the initiative must have a thread( or two ) in the Breeding Journal forum detailing their progress thoughout the challenge. Anyone that does have a regularly updated thread will at the very least be guaranteed of receiving a certificate of participation. There will be other awards as well given out during the course of the Initiative for achieving specific milestones and at the end of this year’s initiative. 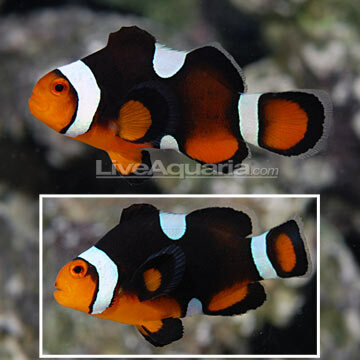 A pair of Sanjay’s Black Photon Clownfish is now available on Diver’s Den. This pair of Black Photon Clownfish was produced by breeding one Darwin Black Ocellaris Clownfish and one true “Onyx” Percula Clownfish. They are so nice. We’re sure they’ll be gone fast, so check them out here. 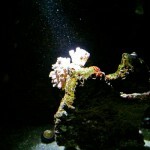 As always with Diver’s Den, it’s WYSIWYG, so you get the pair you see in this photo. The pair is currently $149. This video was shot outside of Lautoka, Viti Levu in the Fiji islands of the corals at low tide out of the water. 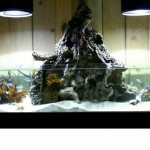 You can see several acros and other sps species completely out of the water. You can see several large colonies that look like they have been placed out of the water. Check it out. 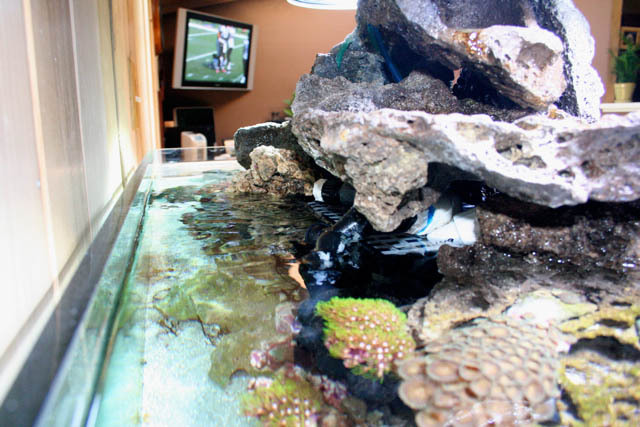 This 750 Gallon Soft Coral Reef Aquarium is a beautiful demonstration of just how nice soft coral tanks can be. 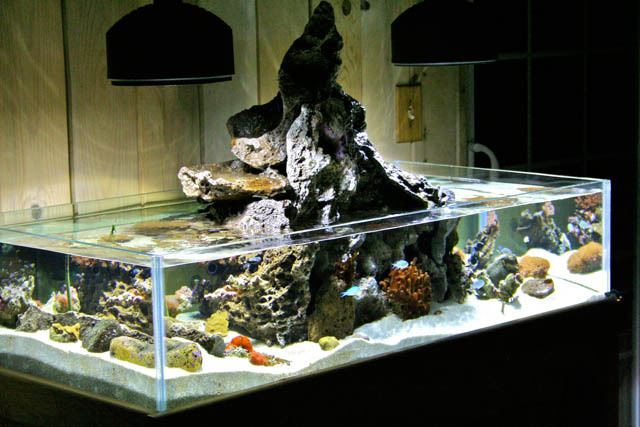 This large reef tank is packed with some very mature reef fish. 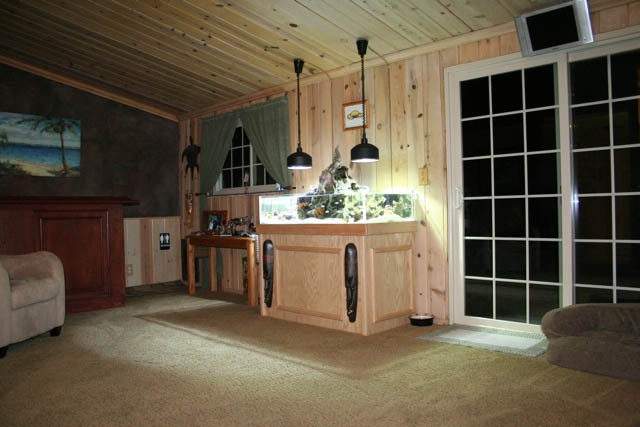 I’m not sure I would ever stop adding fish to a tank this big… What? another tang? sure. 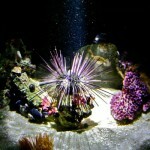 Reef Tools has taken the next step in creating an interactive online reef community. 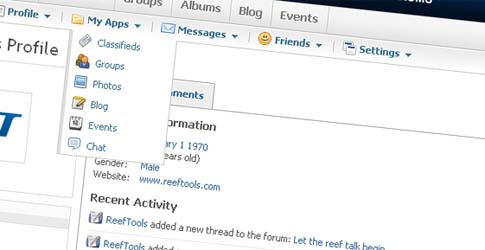 More than just a forum, Reef Tools Live offers free profiles, blogs, groups, photo albums, events, classifieds, public and private chat, and much more. Sign up, create a profile, invite your friends and have fun. If you have any questions, or suggestions, please let us know. We are excited to hear what you have to say. A Fluval G Series filter live action video is finally available. With its Novembe 2009 US retail store release date coming up, the Fluval G has recently been spotted at various industry trade shows including the Las Vegas Superzoo and Chicago Backer shows. 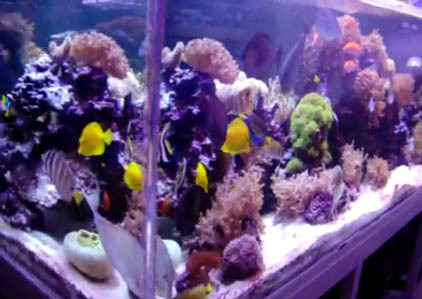 The Backer show in Chicago, provided this video of the new Fluval G Test Drive Station. 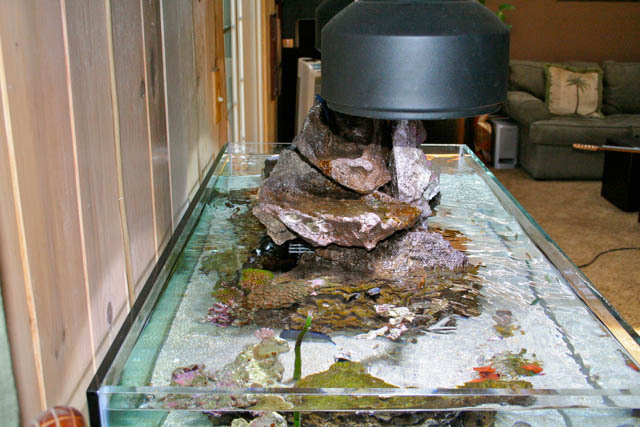 Once this new aquarium filter hits the shelves, you can expect to see these demo stations at authorized Fluval G dealers across the country. 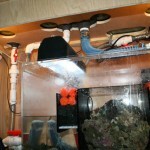 Each Fluval G Test Drive Station will have a fully functional Fluval G unit along with detailed product information. You will be able to check out the new HydroTech performance monitor in action, as well as review detailed explanations of the major features of this new aquarium filter. Enjoy the video. The IceCap Reef Illuminations line is the latest and greatest from IceCap Inc. 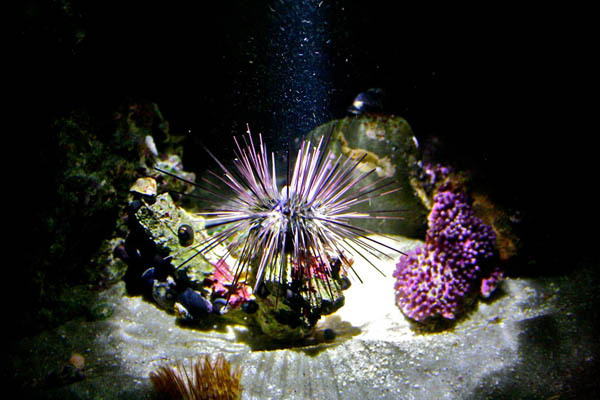 The IceCap Reef Illuminations line offers combinations of MH/T5/LED or T5HO/LED. 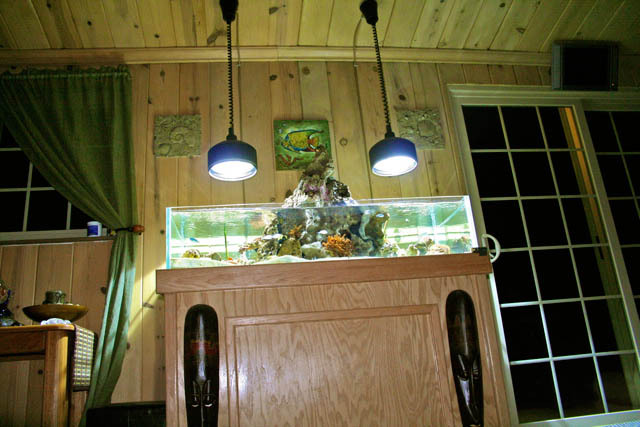 The addition of actinic LED to the IceCap Reef Illuminations fixtures, seems to convey an understanding by IceCap Inc. of just how important aquarium appearance is, to today’s hobbyist. 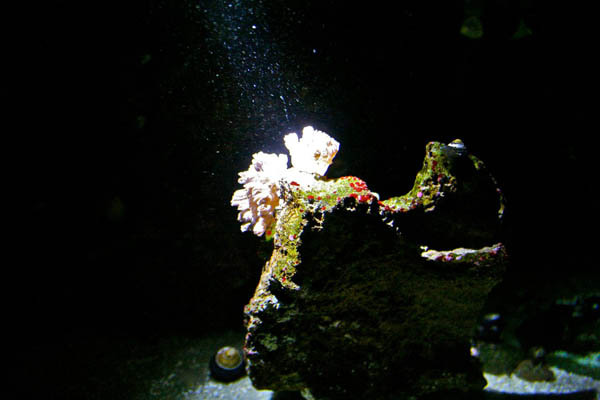 Although these LED lamps are unlikely to provide much in the form of added PAR, they should assist greatly in making corals pop. This might allow hobbyists to use lower K metal halide bulbs and still achieve the overall color temp they desire. 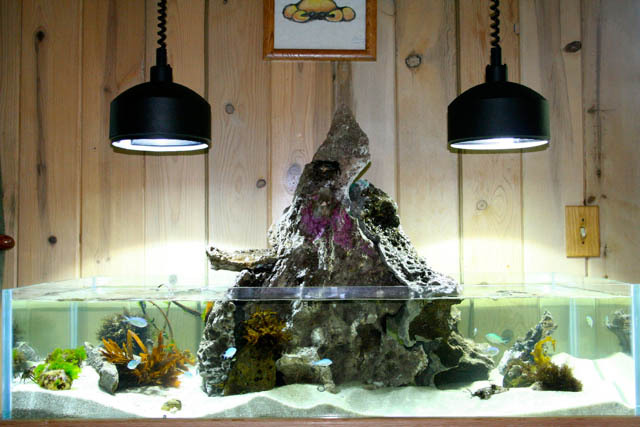 We’re looking forward to getting our hands on one of the IceCap Reef Illuminations fixtures and checking it out. 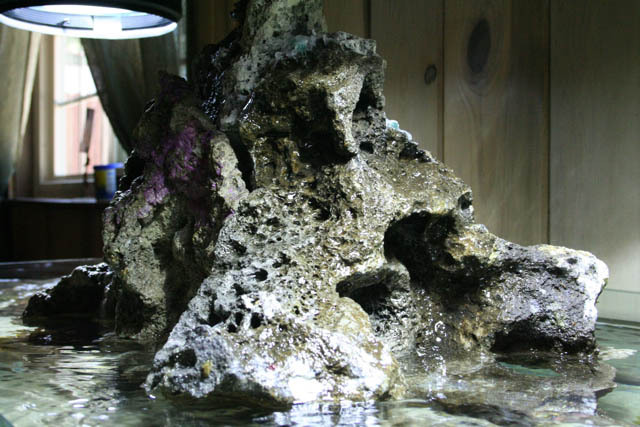 A few months ago we posted a video of this beautiful reef tank. We were just informed that a new, updated video has just been released. 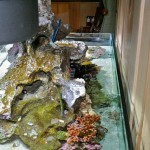 This is a 55 gallon AGA SPS dominated reef tank, with a few LPS and rare zoas. 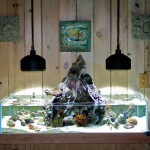 The owner of this reef tank states “A lot of new stuff and less problems!”. That seems like a GREAT update. 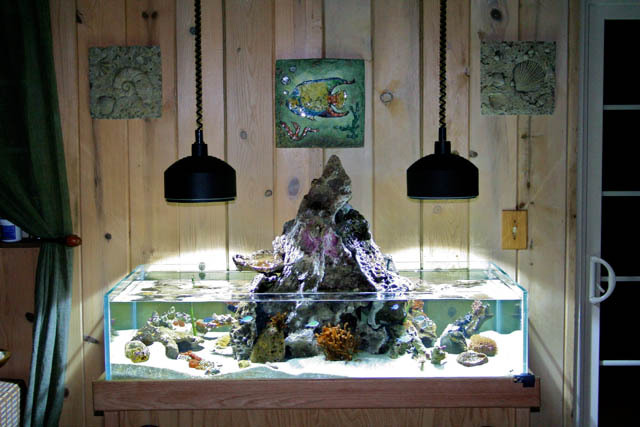 A 6x54W bulb TEK T5 fixture is used to light this reef tank, and a AquaC Remora protein skimmer is the primary source of filtration. 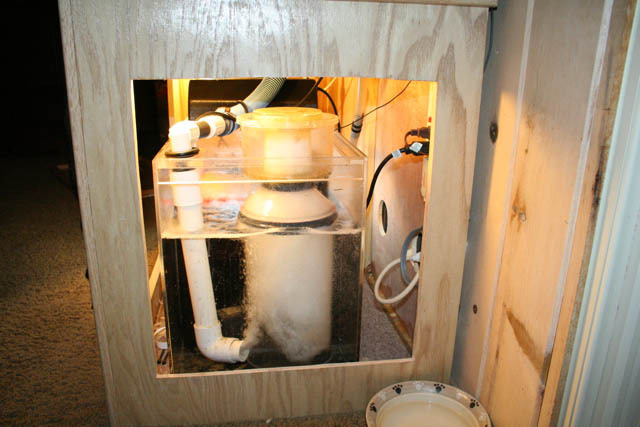 This system is run with no sump and no refugium. 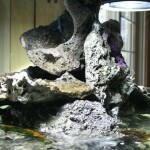 10 gallon water changes every 10 days assist in the removal of nitrates. Daily, 30ml dosing of ESV Bionic 2 Part maintains Calcium and Alkalinity at the desired levels. 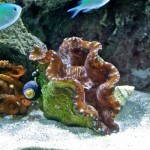 The livestock in this 55 Gallon reef aquarium looks extremely healthy, displaying outstanding polyp extension. 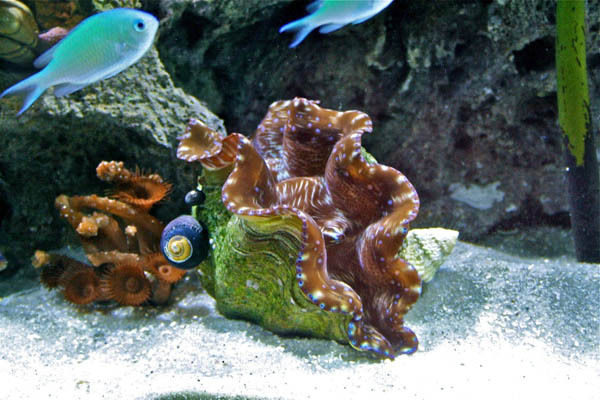 Beautiful clams, encrusting montis, chalices, and colorful Acropora Species populate this 55 Gallon Reef tank. 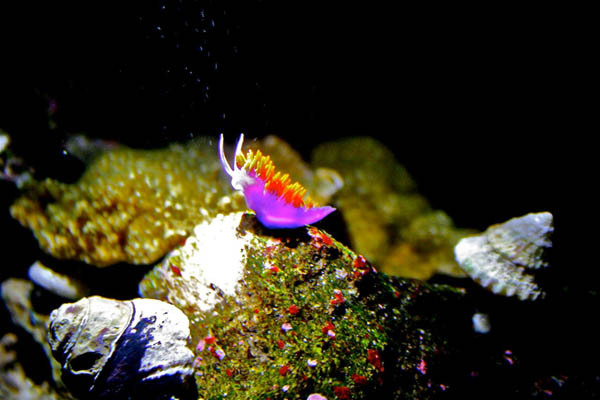 Finally, A Pink Skunk Clownfish is hosting is a great-looking anemone. Keep up the good work!